Italian TV drama series depicting the life of Mafia crime boss Salvatore ‘Totò’ Riina, here portrayed by Claudio Gioè, between the years of 1943 and 1993. Riina finds himself the head of his family when he is still just a young man after his father and brother are killed by a war bomb that had remained active. 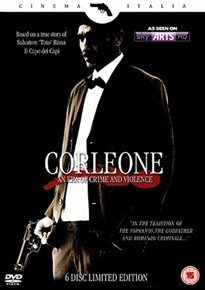 Enduring a life of poverty, he becomes involved with the local Mafia in Corleone, Sicily. As he rises through the ranks he eventually dominates the small town and then Palermo. Meanwhile, his childhood friend Biagio Schirò (Daniele Liotti), who is now a cop, and various other law-enforcement members try to apprehend Riina and put a stop to his ruthless crimes once and for all.